Saying that ZTE and especially its smartphone business is currently in a rather tough spot is kind of an understatement. With a ban from purchasing Qualcomm chips already in effect and rumors of a potential Android licence revoke, it really does seem like the company's entire handset business is in jeopardy. 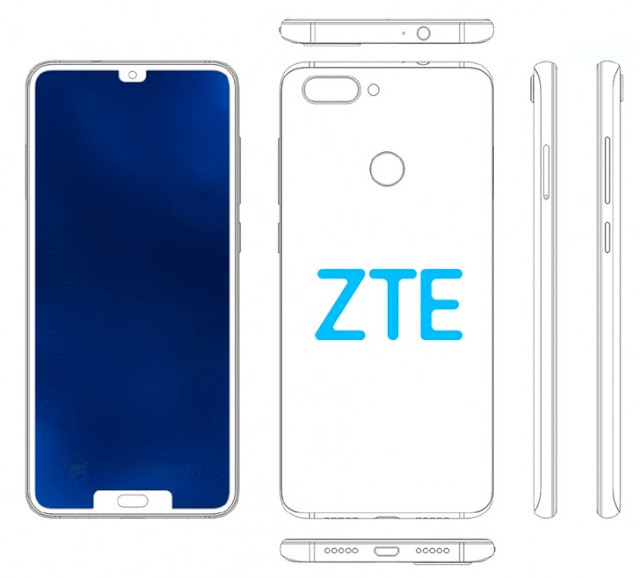 ZTE, however, seems to be rather undeterred by all the commotion, or at least positive enough to continue its design work. A recent patent filing, with China’s State Intellectual Property Office (SIPO) shows a new ZTE handset, featuring a pair of screen notches. It comes hot on the heels of yet another dual-notched ZTE design, dubbed the "Iceberg". So, it's safe to say the Chinese manufacturer has really taken the controversial notch fad to heart. Literally doubling down on the concept might not be a bad idea either, since with every polarizing design trend, there's always the possibility to hit niche gold status with just the right kind of odd offer. Looking at the newer of the two submitted sketches, there are some notable differences. Unlike the ZTE Iceberg, with its wide top earpiece cut-out and a seemingly empty bottom one, the newer handset is a lot more reminiscent of the Essential PH-1 phone. The top part of the display is only disturbed by the selfie camera module. While, on the opposite side, the notch houses what looks like a home button/fingerprint reader. We can definitely appreciate some good old physical controls on a modern handset and so will others. Design concepts and patents, however, have a long way to go until becoming real viable products. Considering ZTE's ongoing and rather severe brushes with the US government and the sanctions already in place, we can realistically expect to see one of these new devices no early than mid-2019. If at all.